When active treatment is no longer the focus of care for an illness, hospice care concentrates on relieving symptoms and supporting patients and their families with compassionate end-of-life care. Hospice patients generally have a life expectancy measured in months rather than years. Although hospice cannot add days to a person's life, it most certainly can add life to their days. Hospice care is available in private homes, assisted living residences, hospital or other living facilities. Aspirus offers hospice care through Aspirus Comfort Care and Hospice Services, Aspirus Hospice House, Aspirus At Home, and LeRoyer Hospice. Click on locations for more information about each program. When active treatment is no longer the focus of care for an illness, hospice care concentrates on relieving symptoms and supporting patients and their families. Hospice patients generally have a life expectancy measured in months rather than years. Although hospice cannot add days to a person's life, it most certainly can add life to their days. Palliative care is available any time during a person’s serious illness – much earlier than hospice. The goals of palliative care are to improve the quality of life for a seriously ill person and to offer caring support to them and their family both during and after treatment. At Aspirus, we believe it is very important to provide home services where people are in familiar surroundings and close to their family. Although most people are able to live in their private home, some people choose other options for home including Hospice House, nursing home or residential facilities. Routine home care is provided when symptom control and pain management can be achieved through periodic, scheduled visits. The specific services are based on identified needs and are designed to support the patient and family and to prevent crisis situations as much as possible. Aspirus can provide care in hospital settings. Inpatient acute care is provided to meet physical and/or medical needs which cannot be met at home. The purposes of inpatient care are to achieve management of acute symptoms, to teach the patient and family how to manage symptoms, and to transfer to a home setting. 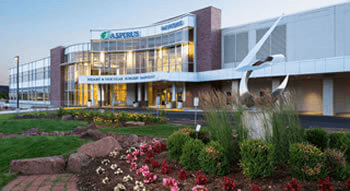 Inpatient Respite Care may be an option at some Aspirus locations. It typically is for up to five days at a time on an occasional basis. Respite care is designed to provide the primary caregiver and family rest or time away. All necessary hospice services are part of the service and staff will help to coordinate arrangements. For patients who choose home-based respite care, hospice volunteers help care for loved ones. The goal of spiritual care for is to meet the needs of patients and families. We find that there are common spiritual needs identified by many terminally ill patients: the need to reflect on the meaning of life, the need to tell one's life story, the need for belonging and community, and the need for hope. We are committed to being nondenominational in the care that we provide. Our goal is to partner with a patients' choice of spiritual support and offer additional support as needed. Every hospice patient has a social worker that is assigned to work directly with them and their family members based on the plan of care. The social worker ensures that the plan of care is designed to meet the psychosocial needs of the patient and family. Social work services include assistance with: personal concerns, preparation of advance directives, financial concerns, and accessing other community services. Bereavement care is offered to the patient and family members. Grief support services include support in dealing with loss and grief, counseling and referral to other community services. Family members may be referred to and/or select bereavement support from other community agencies. Aspirus also offers select bereavement services to the general community in some locations. These services focus on normal grief reactions and are not designed to meet the individual needs of a specific bereaved person. Therapeutic massage is offered to support the physical, emotional and spiritual needs of patients and is a tool for pain relief and symptom management. Massage has been shown to reduce pain, decrease stress and anxiety, heighten peacefulness, and restore emotional balance and overall physical comfort. Music Therapy uses sounds and music to support and encourage physical, mental, social, spiritual and emotional well-being. Music can help to ease pain, decrease anxiety and stress, increase relaxation, enhance memory, promote communication, express feelings and increase quality of life. Therapy dogs may visit people at some Aspirus locations. These dogs provide comfort, love and companionship and enrich the quality of life for hospice patients and often family members as well. The sight of therapy dogs and the touch of their fur often brings peace and joy to people whose life once included animals. Physical contact has a calming effect and dogs have the ability to bring back pleasant memories of a person's life. Using palliative care (comfort) measures to enhance quality of life. Accepting death as a natural part of life. Controlling pain and other distressing symptoms. Neither hastening death nor artificially prolonging life. Hospice does not support assisted suicide. Respecting the wishes of the patient in accepting or refusing care, and not forcing treatments or care on patients. Viewing the patient as a whole person. Supporting the family and caregivers as well as the patient. Assisting the patient to remain at home surrounded by friends and loved ones until death. Hospice can also be provided in assisted living and nursing homes. Using an interdisciplinary team of trained professionals and volunteers to care for the physical, emotional, social and spiritual needs of those near end-of-life. Assisting in any way possible to help the terminally ill person feel valued and important, and to feel a sense of completion in his/her life. Providing bereavement support to family and caregivers, and providing an opportunity for the expression of their feelings about death and loss.